Flexi-Crete Penetrating Concrete Sealer (PCS), is a clear, non-toxic, odorless, water-soluble liquid compound, that hardens, densities and dust proofs new and existing concrete floors. 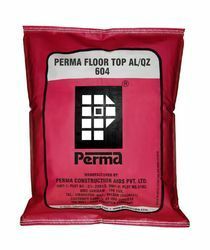 We are leading manufacturer exporter of Floor Hardeners Construction Chemicals. It is factory blended material for the light, medium heavy duty abrasion resistance requirement of concrete floors. It is broadcast over the green concrete floors. Our material is well known in industrial world for the quality of the material. Shelf Life: 12 months under normal warehouse conditions.